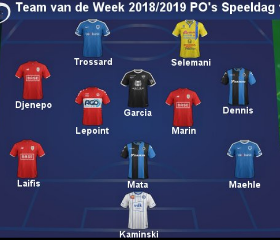 Nigeria U23 international Emmanuel Dennis has been named in the Team of the Week for the opening round of matches in the Belgian First Division A playoffs. The skillful winger provided two assists as Club Brugge thrashed KAA Gent 3-0 on Sunday and it would have been more if Diatta had not been caught offside in the build up to the fourth goal which was disallowed. Voetbalkrant.com selected Dennis in the right side of midfield in a 3-5-2 formation, the same position he was deployed against Gent. Speaking after the game, Dennis said : ''Trust is important, I get that from the coach too and it was good that I could help my team win. ''I wanted three assists, that was equivalent to a 'hat trick'. I really have to work on those assists and play less with my head in the ground. ''I really want to give more assists , my position as a winger demands that too." Dennis's only other assist this season came against Red Bull Salzburg in the Europa League in February.